Our ever popular Green Mist, Lime Green Mist, Star Mist, Star Mist Yellow and Green Star are now joined by Single Star. All six varieties will need disbudding to produce good sized blooms, or they can also be grown as sprays. All other aspects of cultivation are the same as for late sprays, so follow either set of cultural instructions by clicking here. Some of the Mist series are now classified by the National Chrysanthemum Society so that they can be exhibited at their shows. See individual varieties. All plants are clearly priced on the website. Most varieties are £2.80 each, Gentech Stock varieties are £3.30 each. 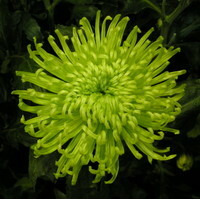 Buy any 10 plants, or more, and receive a 10% discount. Postage and packing on all orders, to UK addresses, is £3.95, regardless of the number of plants ordered. Due to the number of orders going to the EU that were being delayed, and having to be re-sent, we will now only send parcels to the EU by courier. Unfortunately this has meant a large increase in the cost, but it does ensure that orders arrive promptly and in excellent condition. Therefore, all EU orders are subject to a P&P charge of £45.00. Sorry, but we cannot send orders beyond the EU. We accept all the major credit cards in addition to Paypal. All your personal details are encrypted on our site using 128bit SSL security. All card payments are handled securely by Sellerdeck Payments, which is powered by Creditcall. Sorry but we do not accept American Express. All of these Late Spray varieties are protected by Plant Breeders Rights, and must not be propagated without a licence.